Stay updated on Tournaments, Website Updates, New Moderators and Administrators, as well as Important Plot Updates occurring in the Role-play World. Only Staff Members can post here. Here you may read the rules in order to avoid getting banned for being stupid. The hard-working staff of 'Adrenalin-Zone' do not ask a whole lot out of you guys, the members. The least you can do is read over the short topics of rules that you may encounter within this forum - so please consult them before even entering the chatbox, making your character, or PMing someone. This forum has been created with the sole intent to give leaders of any group, organization, country, etc. their own form of news, in order to create a proper circulation of flowing information throughout their members. All posts made by the leaders must be known by their character and put in an RP Newspaper Format. This means that the leader of the CIA can not randomly put up 'Warning! Enemy is Secretly Planning to Attack! ', when your character knows nothing of the sort. If you have any ideas to make this site better please post them here. Your input will be greatly appreciated, so long as it is entirely constructive. On another note: please do not post up a suggestion based on only your opinion, and quite possibly no one else's. We'd like for suggestions to benefit the entire RP community, not just a select few members. 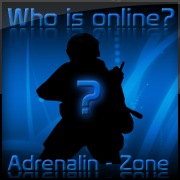 If you are new to the Role-playing Community of Adrenalin-Zone, post your greeting or introduction in this forum! Try to put as much information about yourself as possible, this is so that people may get to know you more easily. Although you are not completely required to post up your greeting to the fellow members, it is certainly well recommended. For whom it may concern and for whatever reason(s), you will probably leave the RPG site for a little bit or forever; if forever is the case, you will be greatly missed by all. It is actually required to post up an away topic if you plan on leaving, so that we will know how long to wait for your return. Those facing unexpected problems, such that were unforeseen, will be excused from being required to post an away topic - but you will need a very good reason. Here you may copy and paste the character creation template into a new topic, fill out all of the required fields, and wait for one of the working staff members to approve your application, or post the faults and mistakes that must be fixed. Please be patient, staff members are working hard to give you the best RPing experience possible - which they can not do properly if they are constantly being nagged and worked like dogs.